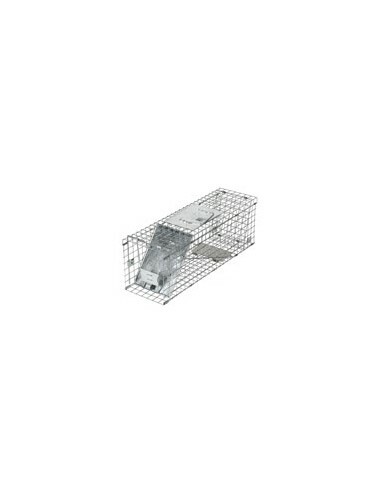 The Havahart Medium Collapsible 1-Door Rabbit & Squirrel Trap #1088 two-door cage live squirrel has been designed with the safety of the medium animals in mind. This humane raccoon trap, with its one spring loaded door, has many features to allow safe, quick and easy catches. This rabbit, squirrel and skunk trap is collapsible so it's easy to store, easy to set up - lift handle and it snaps into place! It's a great space saving design! Havahart Medium Collapsible Traps are constructed of sturdy rust-resistant wire mesh with steel reinforcements for long life and galvanized for maximum resistance to rust and corrosion. Mesh openings of these animal traps are smaller than competing traps of comparable size to prevent escapes and stolen bait. Spring loaded doors and sensitive triggers ensure quick, secure captures that target the specific animal's size, eliminating undesired catches. Solid doors and handle guards protect users during transportation, while smoothed internal edges protect and prevent injuries to animals. These live rabbit, squirrel and skunk traps are used by professional trappers and animal control officers. Made in the U.S.A. It contains mesh openings, smaller than competing traps of comparable size, which help prevent escapes and stolen bait. Two gravity-action doors allow an animal to enter from either direction. Sensitive trigger ensures quick, secure capture that targets the specific animal's size, eliminating undesired catches. With two gravity action doors, our smallest trap helps prevent animal injuries. Ideal for Trapping: squirrels, rabbits, skunks and mink. * Also ideal for trapping squirrels, rabbits, skunks and mink. Humane Live Easy Set Animal Traps from Havahart - the recognized brand leader in nuisance animal control !